The court’s rejection of warrants for two former Supreme Court justices allegedly involved in a massive power abuse scandal on Friday raised questions on whether the judiciary was seeking to contain the damage by pinning all the blame on one person. 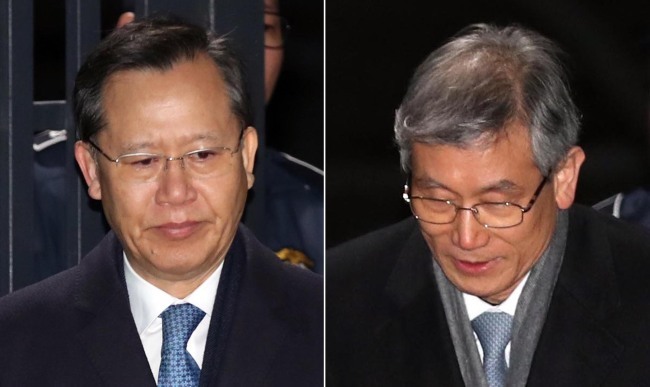 Two judges at the Seoul Central District Court on Friday denied prosecutors’ requests for warrants to detain retired Justices Ko Young-han and Park Byong-dae, saying that charges against them were not sufficiently substantiated to warrant a pre-indictment detention. The warrants were sought in relation to a number of suspected offenses, including abuse of power and dereliction of duty. The judges also said that a wide range of evidence had already been collected, and the two are unlikely to destroy evidence or flee, given their attitudes in the investigation so far. Prosecutors said they would again request warrants to detain Ko and Park, according to news reports. So far, only Lim Jong-hun, a former deputy chief of the Naitonal Court Administration, who was arrested in late October, has been indicted. He faces charges of abuse of power, dereliction of duty and obstruction of justice, among others. Lim is suspected of being the key figure who helped former Supreme Court Chief Yang Sung-tae use politically sensitive trials as bargaining chips in lobbying for then President Park Geun-hye’s support to establish a separate court of appeals, Yang’s long-held wish. Prosecutors accuse Lim of pressuring judges to make decisions in favor of Park’s conservative administration as park of Yang’s scheme. Lim allegedly abused his power to postpone a damages suit against a Japanese firm filed by Korean victims of wartime forced labor, and assisted the Foreign Ministry in building its argument against the victims. Prosecutors accuse Lim of colluding with Ko, Park and Yang, and suspect that Ko and Park, as Lim’s supervisors, were reported to on Lim’s activities, or at least connived in them. Park was confirmed to have visited the presidential office to allegedly discuss what was then an ongoing trial of a Japanese firm’s compensation for Korean victims of wartime forced labor, which had been held up at the top court for five years. Prosecutors also found that Yang met with the lawyer who represented the Japanese firm in the case to discuss the trial, and suspect that Yang leaked classified information on the trial. Other trials in question include cases involving a progressive teachers union, laid off temporary workers of the KTX high-speed rail system, and former state spy agency chief Won Sei-hoon who was given a jail term for election law violation. The Supreme Court on Oct. 30 ruled that Nippon Steel & Sumitomo Metal Corp. must compensate the victims for their forced labor. On Nov. 29, the top court ruled that Mitsubishi Heavy Industries must also compensate the victims of forced labor.